It has been a very long road in the development of Black Desert, but we can finally announce that we will be launching March 4th, with early access being granted to those who pre-order. We’re delighted that we are almost at the launch point, and hope that you are as excited as we are that Black Desert is launching soon! Base game and all future updates, 24-hour early access, Exclusive Shepherd pet, 30-day value pack, 500 Pearls, and an in-game title. Base game and all future updates, 48-hour early access, exclusive shepherd pet, 60-day value pack, 1000 pearls, in-game title, tier 3 Horse and the Trina Knight horse gear set. Base game and all future updates, 72-hour early access, exclusive shepherd pet, 90-day value pack, 3000 pearls, in-game title, tier 5 horse (White), Trina Knight horse gear set, Trina Knight wagon set, exclusive Shudad Classic set, exclusive Young Fogan (tier 2) pet, permanent horse flute, 3 types of EXP scrolls x10 (30 in total) and 1 storage maid. 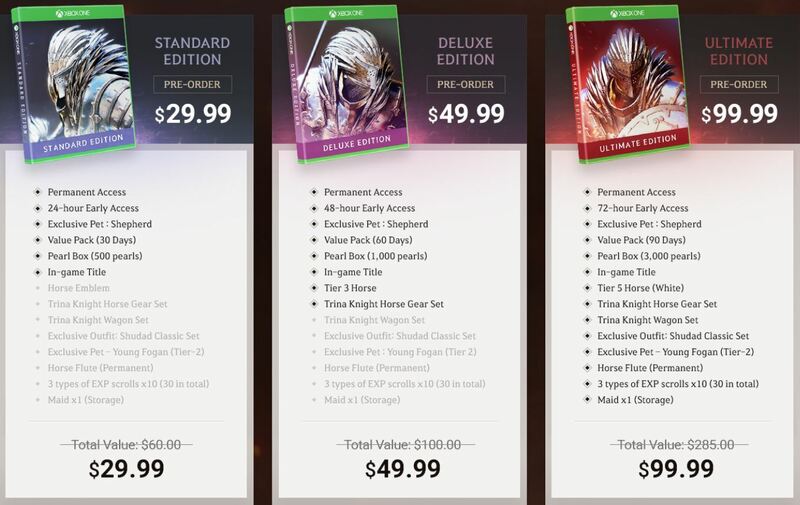 The packages offer incredible value, and will only be available for the pre-order window! Make sure to pick up your Black Desert pre-order packages from the Microsoft store.